A considerable collection deserves to be displayed, not left to gather dust on the sidelines. With this 8 Tier Wall Mounted Sword Rack, you can take eight of your finest pieces and transform them into a single display that will awe you and your guests. 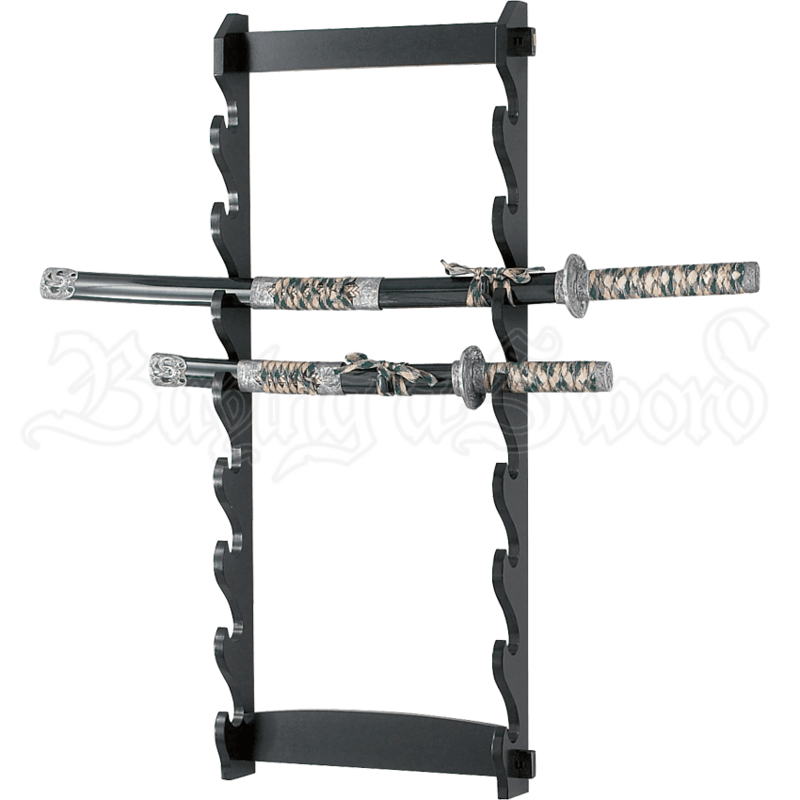 Blessedly uncomplex, this sword stand is designed to put all the focus on your swords, allowing you to show off 8 of them with ease. The sword stand is made entirely from hardwood and features a black lacquered finish. It features two supports, one at the base and one at the top, as well as 8 continual tiers that are perfect for display swords of all different shapes and sizes (as well as rifles and rifle replicas, if you collect those). 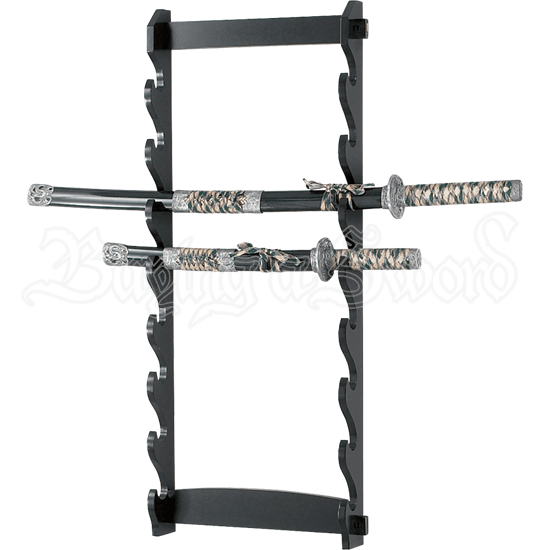 This rack sits on the floor, but please be aware that this sword rack is not a free-standing rack, as it requires the support of a wall (to which it is usually affixed or bolted) to stand properly. Eight swords is practically a collection on its own, and thanks to this 8 Tier Wall Mounted Sword Rack, you can have the means to show off that collection with ease in the comforts of your own home. This rack is easy to assemble and sturdy. I would have preferred that the horizontal cross pieces were attached by either a screw or small nail rather than the wooden pegs. The kit only provides screws and wall anchors for the top end of the rack. If you mount it high on the wall, you will need to drill a couple of holes in the lower cross piece so that you can secure the bottom to the wall with screws screwed into wall anchors. The additional screws and wall anchors are not provided for the lower mounting and must be purchased separately. I use the rack to display my collection of lightsabers.